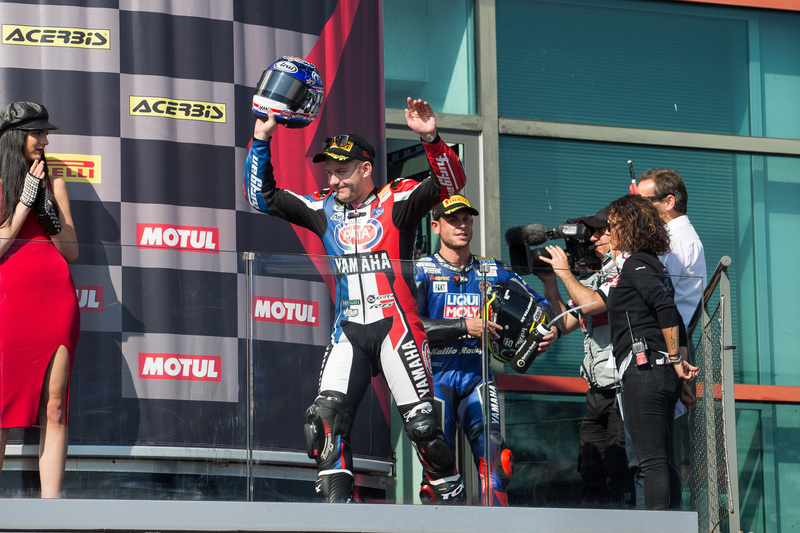 GRT Yamaha Official WorldSSP Team rider Lucas Mahias thrilled the French crowd with a heroic ride to third place in Magny-Cours, to claim his third podium finish of the 2018 FIM World Supersport season. Federico Caricasulo was part of a four-way battle at the front of the race until his podium hopes were dashed with a crash on the final lap. The Italian remounted to finish 13th and in the points. European Supersport Cup rider Alfonso Coppola rode a solid race to 25th position, having started from pit lane. Mahias had to ride through the pain barrier to secure his podium finish today. The reigning World Champion slipped on a wet floor in his hotel room yesterday evening and sustained an injury to his left ankle, which he exacerbated in a crash during morning warm up. The joint was swollen and painful following the crash, but the swelling had subsided sufficiently to allow Mahias to race this afternoon. It was Jules Cluzel who led the charge on the opening lap, shadowed closely by Mahias, Caricasulo and current championship leader, Sandro Cortese. By mid-race distance the leading quartet had pulled out a gap on the rest of the field and looked set to battle it out between them on the final lap. The GRT Yamaha pairing of Caricasulo and Mahias had closed right onto the back of Cortese and Cluzel as they hit the braking area for turn 13 on the final lap. Caricasulo, pushing hard to find a way past the championship leader, ran slightly wide on entry and then lost the front and crashed as he tried to defend against Mahias, who’d taken advantage of the gap to dive up the inside of his teammate. Mahias went on to claim third and the final step on the podium in his home race. Caricasulo managed to remount to finish in 13th place and pick up three vital championship points. The Italian drops to fourth place in the championship standings as a result, 37 points behind series leader Cortese with just two races remaining.